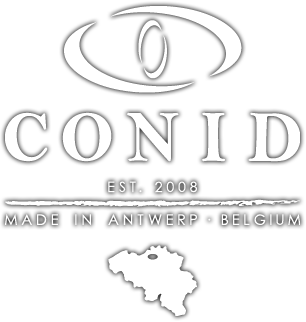 Conid pens are manufactured in Antwerp, Belgium. The number made is still small, so if you become an owner you will be one of a select few. The company’s principle product is a high-capacity fountain pen called a Bulkfiller. The story of Conid began with Francis Goossens, well known on pen social media as ‘Fountainbel’, a design guru and specialist repairer. 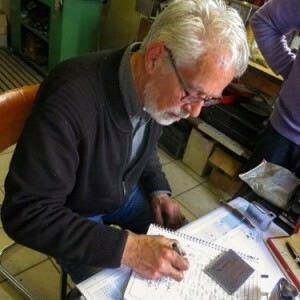 He retired as an engineer in 2008 and developed a passion for collecting fountain pens and vintage knives. Amongst his early repair achievements is a replacement sealing cartridge for the 1930s Sheaffer rod-fill pens. The original seals were not designed for a long life and, no doubt, the repair shops of the time were set up for rapid replacement with a ready supply of spares. These supplies are long gone. Francis’s replacement was made in his own workshop and supplied as a complete repair kit including tools. He used modern long-life sealing materials that are all but invisible in use. After years of experience with repairs, Francis wanted to create a fountain pen that matched his best expectations and applied his design skill to what he regarded as a common flaw in current pens: the ink capacity and the short life of the filling mechanism. One of his guiding principles is: ‘When you’re stuck on a problem, never attack the consequences, fight the root cause.’ This philosophy demonstrates his true engineering skill in understanding something before going for a solution. The next part of the story concerns Werner Helsen and Komec, an engineering company established by his father in 1980 and currently directed by Werner. Werner and Francis have been friends for many years, Francis having worked as an R&D engineer at Capsugel, a significant customer of Komec Helsen. When Francis started designing his first pen prototypes he needed tooling and parts that were beyond the capabilities of his own home workshop, so he turned to his friend at Komec. This was in late 2007, and Conid was born as a daughter firm of Komec. The name represents ‘Concept and Ideas’, and the fountain pens are the first of many concepts that will come to market in the near future. 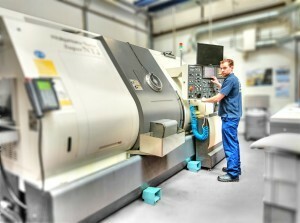 Komec’s super-modern and very clean machine shop was one of the first to take on computer-controlled systems, and the latest Computer Aided Design (CAD) suite feeds computer numerically controlled (CNC) machining centres with an integrated administrative system. All of this is state of the art and gives the opportunity to work to very high quality and exacting standards. It is no surprise therefore that they achieved and maintain ISO 9001 qualification with ease. Those who have worked in industry will be familiar with visiting companies whose ‘vision’ statement is displayes prominently in the visitor reception, but this worthy ideal does not survive the walk through the door into the factory. This is clearly not the case at Komec where vision drives both the factory and product. It is no surprise therefore that they achieved and maintain ISO 9001 qualification with ease. After a few development modifications, the prototype Conid fountain pen was shown at the 2008 Tilburg Pen Show. In December 2008, sample pens went out for writing tests, and in 2009 a pen series was launched at the Cologne Pen Show. These were still early plunger filters. Werner and Francis developed the prototypes further. Thinking of George Bernard Shaw’s quotation: “You see things, and you say “Why?” But I dream things that never were, and I say “Why not?” the Conid Team sat together and concluded that they should start from a syringe and make it retractable to give a compact filling system. Werner also wanted protection of a patent and made an application – since granted. Today, Conid can proudly display its patent for the one-of-a-kind filling system. Werner is the founder of the Conid brand. An entrepreneur, he will always strive towards perfection and try to get the most out of the people around him. His many visionary ideas are explained with great warmth and enthusiasm. The Conid team benefits from three decades of experience and companionship between colleagues of three generations. Jonas Haertjens, is responsible for tasks such as keeping production drawings for the parts up-to-date and processing incoming web orders. His job at Conid forms the perfect opportunity to express his passion for technology and design as well as blending into the scene and getting more absorbed by the writing equipment community. Johan Robbroeckx learned his machining skill at Komec on parts made to very small tolerances and high standards expected for the pharmaceutical industry. He naturally took charge of machining the pens to achieve perfection! Since late 2014, and following training from Francis, he also dedicated himself to the fine-tuning and grinding of nibs making him Conid’s nib specialist. Lukasz Kramarz is in charge of finishing all of the parts. This incorporates polishing, deburring and cleaning – all of the actions needed to turn machined parts into a high-quality finished product to Conid’s exacting standards. Koen De Herdt, the latest member of the Conid Team, is neither an engineer nor a technical expert. He handles publicity through social media as well as bringing pens to their users. The ‘Bulkfiller’ features a piston, sealed with industrial ‘O’ rings. It also contains a novel rod system that locks the piston at full capacity while allowing the rod to disengage and be stowed in the pen reservoir when filling is complete. It is an elegant solution and, while not the simplest, uses fully machined parts of high strength and durability. The pens currently use Bock nib units of gold, titanium or stainless steel. With just the exception of the nib unit and seals, all parts are machined from solid stock giving a very strong, high-quality product. The pen components have been given rigorous engineering testing, and the filler system has gone through one million operating cycles on a computer controlled jig. The clip is made from a solid billet of titanium, a material not easily formed but milled if you have the correct cutting tools. This is a time-consuming process but chosen wisely to maintain the desired functional requirements. While other manufacturers generally use a pressing that gains its strength by curling the edges downwards and forming an end ball, the Conid clip has a solid ‘D’ shaped cross section; the result is a flexible yet strong, durable and elegant clip. Every Conid client benefits from a personal service. When ordering from the webshop the client can specify the desired nib grinding and personalised engraving on the clip and box. A ‘Personal Writing Identity Form‘ is about to be rolled out recording choices including left or right hand, the writing angle to the axis of the written text (baseline angle), desired ink flow (wetness), writing speed and the pressure normally applied. Engineered for people who love writing! A very small number of manufacturers are known to test their nib units after assembly. Our past WES President Geoff Roe, has addressed our Society on te inadequacies he has experienced from production pens – even well-known quality manufacturers. After your Conid pen is assembled, Johan will tune the nib to write as requested and will supply a writing certificate with the pen to demonstrate performance – another personal service that is unavailable from any other manufacturer of which I am aware. Social media comments confirm the smoothness and pleasure of writing with one of these pens. This is a major strength of the Bulkfiller ideal encapsulated in Conid’s motto: “Engineered for people who love writing!”. Francis Goossens‘ vision of the Bulkfiller was ‘a pen without compromise‘ when he entrusted its original manufacture to Conid back in 2012. The design has an additional advantage that the turbulence created when vigorously flushing with clean water cleans the inside cavities of the pen thoroughly. Nevertheless, there is the option of obtaining a Conid tool for an additional €15 on your purchase that allows the user to disassemble the pen completely giving access to all components for easy service and overhaul. Anybody who has had to deal with a dried out pen with encrusted ink knows how useful that is. Thus it is possible to swap pen parts easily and clean your pen properly. This compares with every other manufacturer that insists that any such action invalidates the warranty. It is hardly surprising therefore that Conid has an enthusiastic following in the writing fraternity and vigorous support on social media. The Bulkfiller comes in five sizes from ‘Slimline‘ holding 2ml ink to ‘Giraffe‘ with a massive 6ml capacity and a posted length of 22.5cm. For all its advantages, the Bulkfiller is not the only pen series Conid have made. They release limited editions to mark special occasions. In 2014 only ten pens of each of the ‘In Flanders Fields 1914-1918‘ model were produced, manufactured in Tibaldi celluloid with a flat-top and streamline shape, marking the centenary of the start of World War I where Belgium was part of the battlefield. Most recently, the Cappuccino LE (36 pcs) has quickly sold out – this was a regular Bulkfiller in swirly acrylic with stylish titanium end-knobs. The Conid Bulkfiller is a fountain pen whose price reflects its manufacturing heritage and is the result of a passion for perfection consistent with Francis‘ original vision. Werner and his team welcome pen lovers who wish to call in and see them at the factory, but please make contact first. If you wish to meet and talk to the Conid team in person and try their product then you will have the opportunity on several occasions like the London Writing Equipment Show and of course The AntwerPPen & More.